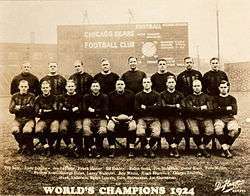 The 1924 Chicago Bears season was their fifth regular season completed in the National Football League. The club posted a 6–1–4 league record under head coach George Halas earning them a second-place finish in the team standings, the fourth time in the last five years. The Bears started slow with 2 ties and a loss, but quickly gained their stride, winning 6 of their last 8 games with two ties. The Bears only loss of the year was to the Cleveland Bulldogs, the eventual champions (the NFL officially considers the 1924 Bulldogs a different team than the Canton team from the previous year – however, all the players were the same). Despite coming in second, the Bears did defeat the cross-town rival Cardinals twice, both shutouts, and their future classic rival, the Green Bay Packers, once in a 3–0 shutout. The Sternaman brothers again carried the team, with Joe Sternaman having his best season. The younger Sternaman scored 6 touchdowns, threw for another, had 9 field goals, and 12 PATs, finishing with 75 of the Bears' 136 points.